Home » Ecology » Bats in the attic? An issue that faces not only developers, but private residents also, is that of bats. More specifically, “have I got them?”. You might not be aware but every species of bat in the UK is protected by law. 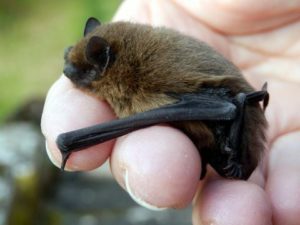 From the common pipistrelle (Pipistrellus pipistrellus) to the greater horseshoe (Rhinolophus ferrumequinum), if your buildings or trees have the potential to accommodate these remarkable little mammals, you may need a licence before you can carry out any building works or renovations. If you want to cut down a mature tree in your garden, or replace your loft insulation, for example, you might need a suitably qualified ecologist to come and inspect the feature for bats. So, what goes into a bat inspection? Phlorum routinely complete these in order to avoid potential harm to bats and to make sure our clients sensibly mitigate any risks of prosecution. It’s quite common to require a tree to be felled. However, if there are bats present, appropriate measures to protect them must be taken. When Phlorum ecologists are assessing a tree for its bat roosting potential, they are looking for certain ‘features’. Different bat species prefer different roosts. Common pipistrelles are a crack-dwelling species and like to roost under small flakes of bark and cracks in broken or damaged limbs. Other species such as brown long-eared bat prefer a larger space and can often be found inhabiting abandoned woodpecker holes. Often a single tree will have numerous cracks, crevices and woodpecker holes. Trees like this have a moderate to high potential to accommodate roosting bats. Immature trees tend to have fewer features associated with bats. However, quite often there can be holes in the lower trunk and at ground level – far lower than most would expect to find bats, although sometimes they will roost here. Generally, if your roof is kept in good condition – i.e. no missing tiles, cracks holes or anything else a bat could use as an entry point – it is unlikely that bats will roost there. If, however, there are cracks that are big enough to allow an index finger to be poked into them, this could provide roosting sites for pipistrelle bats. Common pipistrelles are about half the size of a thumb and commonly inhabit the spaces under raised and cracked roof tiles. When inspecting the building, (as with trees) ecologists are looking for signs of scratching and urination (white powdery streaks) around any cracks or holes. The next signs to look for are feeding signs. Bats have an incredibly fast metabolism and common pips need to eat up to 3,000 insects per night. Often these are moths and butterflies, which leave behind their tell-tale wings. A scattering of insect wings in an area is an excellent sign that bats are present. Of course, what goes in must come out, and these feeding remains are often accompanied by droppings. Bat droppings are similar to those of other small mammals such as mice and rats; however, a key identification guide is that bat poo, when pressed between the fingers, crumbles into a dust composed mostly of insect exoskeleton, whereas mouse poo is more clay-like and smears when rubbed (it can be a glamorous occupation being an ecologist!). Once the building interior and exterior have been inspected, the site is given a bat risk classification between ‘low’ and ‘present’. Depending on the potential of the site to support bats, between one and six activity surveys will be recommended to work out which species and roughly how many bats are using the roost. If the building or tree is classed as posing a ‘low’ risk after the initial inspection, it is considered that bats are probably not present; which can make proposed building, renovation or tree felling works much easier, but less interesting if you appreciate bats!